Office workers can’t help but look forward to the weekend when they can partake in outdoor activities for some active relaxation after long days in front of a computer. Activities such as hiking, camping, climbing, and trail riding are not only a breath of fresh air after a busy work week but also a nice way of keeping fit while enjoying the great doors. Outdoorsy people are susceptible to injuries during their adventurous stints. Out of their excitement to explore, they may forget to take precautionary safety measures. Having a reliable first aid kit designed to stabilize injuries sustained while adventuring. Leading retailer of adventure and preparedness gear, Surviveware, developed a first aid kit that caters to the needs of outdoorsy folks who are always up for the challenge: the Surviveware Small First Aid Kit. This Small First Aid kit contains 100 life-saving medical supplies tailored to the needs of adventure enthusiasts. It includes bandages, adhesive strips, alcohol and cleansing wipes, and steri-strips. The kit also contains several antiseptic and sting relief wipes, emergency blankets, eye pads, gauze and cotton swabs, nitrile gloves, and hypoallergenic tape. The kit also includes a CPR kit that can be removed from the pack and attached to a keyring or hooked to one’s belt loop. The medical provisions are stored in an 8” x 6” x 3” 600D polyester bag with heavy-duty zippers. The pack is water-resistant to help keep the supplies free from moisture and dust. As the container is made of fabric, it is malleable and can be easily stored without cracking or breaking under heavy weight. Survivewaren ensures that the provisions stay fresh by placing them in resealable plastic baggies. This way, owners are assured that each supply is sterile and safe for direct wound contact and free from any unwanted foreign bodies. Moreover, these laminate pouches keep off the water, so supplies stay fresh even when the kit has been submerged under water. A favorite trademark of all Surviveware first aid kits is their organized and labeled compartments. On each label is a supplies inventory note where the number of each item is written. This is great for restocking the kit to its full potential and also gives kit owners an idea on the number of the remaining supplies in the pack. The kit’s organized compartments allow for the easy organization and storage of the medical provisions. These sections help keep the items secure and safe from falling out when opened or handled haphazardly. 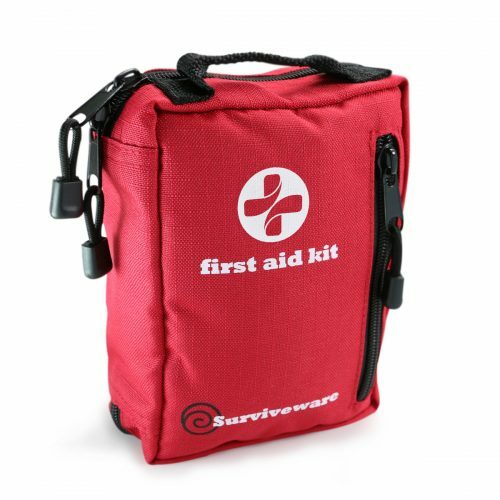 Surviveware’s Small First Aid Kit also offers extra storage space for additional items such as prescription medication, an Epi-Pen, or EDC tools. Having a Surviveware First Aid Kit in the car, home, and office assure owners that whatever happens, everything is covered. Enjoy worry-free weekend adventures with the Surviveware Small First Aid Kit. Get yours now at a 20% discount by using our Amazon discount coupon. Take advantage of this limited offer and make the most out of your purchase by clicking here.